This is a story with a princess, a lying king, a cheating lord, a period of exile, a lesson in what matters in life, a family that argues and cheats, and a mystical element that gives magical weapons from the great beyond. 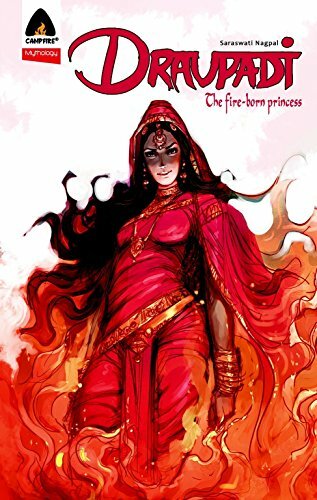 And nothing written inside the story of Draupadi The Fire-Born Princess comes from established Greco-Roman tradition or the eurocentric mindset of the Disney Studio. It is a fascinating story that comes straight from the deepest tradition of Indian literature and philosophy. This book showcases why the graphic novel format has become one of the leading and best ways to help tell a story. Whether you read it on a Kindle or hold the book in your lap while sitting near a sun-filled window, there is such a personal nature to the story telling and art that you can never escape it. Using the sequential art form to tell the story of a national epic helps brings the action and drama right in front of us. For a parent looking to broaden a child’s understanding of the world, this new graphic novel is a find. For an academic looking to introduce the incredible depth of not only India’s myths but those of the world as well to a new generation this is the perfect way to do it. Taken directly from the ancient Indian epic known as The Mahabharata, which also holds philosophical scriptures and is considered the holy book of Hinduism, this is the story of a determined woman who does her best to come to terms with her own demons and live in the world around her. While a woman holds center stage, it is a tale that crosses gender lines as those around Draupadi contribute to her growth as she does to theirs. Her story of her place in an ancient dynasty is as filled with love, betrayal, war, honor and craziness as anything that has ever appeared in the accumulated mythos of the western world. Scholars familiar with The Mahabharata equate its importance in world history on a level with that of The Bible, The Qur’an, and Greek drama. Inside this story Draupadi is the central female role. As she begins her tale she is walking to her final resting place. Told from the point of her memory the story then moves to her earliest days as a princess. When she speaks Draupadi gives us a brief history of those who preceded her in this life, setting the stage for the massive action that is to follow. She introduces us slowly to the world of Indian society and royalty. Over the next hundred plus pages her story and her life gives us a deep understanding of what it means to be human and to be part of something larger. To read this woman’s tale is to see how much our own lives and myths inside western society overlap with the culture of India (and by extension much of the rest of this planet). As Joseph Campbell put forth in his own studies and writings, regardless of the physical boundaries and cultural differences that separate us, we as humans are much closer to each other than we could possibly realize. In its original form The Mahabharata is a long and complex story. Focusing on the story of the Draupadi is the perfect choice to introduce new readers to this epic. As written by author and educator Saraswati Nagpal, the tale unfolds with an action and force that matches Greek tragedy, the most hard fought Roman battles, and the majesty of a Shakespearean drama. While Ms. Saraswati captures the highlights of the story that surrounds Draupadi, she still keeps the story firmly rooted in the woman’s journey from birth to her ultimate ascension into the afterlife. It is a difficult task to encapsulate such a massive story in such a manner but Ms. Saraswati finds the exact tone and never betrays the heart of The Fire-Born Princess at the expense of the story. Bringing her words to life in the graphic novel format the artist Manu gives the tale a weight and heft that almost resembles an action packed video game. The artist gives us clear and precise images to hold onto as well as a host of real human emotions across the faces of the characters. Battle scenes explode off the page and in close up evil holds a smug smirk. This is strong and fully realized art that matches the best of anything to currently appear inside the pages of a DC or Marvel title. The Mahabharata is a filled with loaded dice, cheaters and cowards, brave soldiers, loyalty, and hypocrisy. Draupadi’s journey to self discovery takes a lifetime and through her eyes we see that, while we may no be royalty, our own journey isn’t that much different from hers. There is a wild sense of discovery inside Draupadi’s story. As well as a sense that the distance between western and Indian cultures is a lot less than we ever thought it could be. This is a story that will inspire and fill the reader’s mind with faith and drive for their own lives.